Comparative imagery overview of coastline in Aceh, Sumatra, Indonesia, pre- and post-tsunami. Comparative imagery overview of a village in Aceh, Sumatra, Indonesia, pre- and post-tsunami. 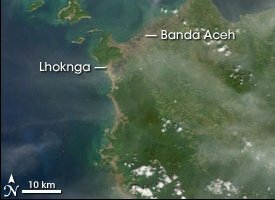 These high-resolution satellite images, acquired by Space Imaging's Ikonos satellite, show Lhoknga before and after the earthquake and Tsunami. Almost all the trees, vegetation, and buildings in the area were washed away. Behind the town, low-lying agricultural areas remained covered with water four days after the disaster, and sand on the nearby beaches was completely removed. The wave height might have exceeded 15 meters (50 feet) when it struck the shore. Comparative imagery overview of coastal area of Aceh, Sumatra, Indonesia, area pre- and post-tsunami. Comparative imagery overview of area of Aceh, Sumatra, Indonesia, area pre- and post-tsunami. Comparative imagery overview of area of Aceh, Sumatra, Indonesia, pre- and post-tsunami. Comparative imagery overview of area of Sumatra, Indonesia, pre- and post-tsunami.